Henley Rowing Club’s Juniors were victorious in seven events at the National Schools’ Regatta in Nottingham over the weekend. During the Friday 1000m events, the J14 coxed quad of Will Properjohn, Cameron Jones, Nick Spicer, and Jack Broadbent with cox Lachlan Reid competed for the Canterbury Cup. Qualifying third in the time trial, they then went on to win their semi-final and meet five other crews in the afternoon final. During a hard fought race over the junior course, the Henley boys took a fantastic silver medal place to start a series of medal wins for the club. 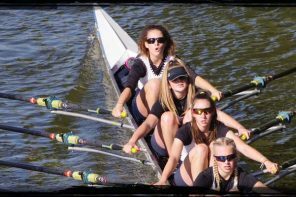 In the girls J14 coxed quad events, the first quad of Ruby Brown, Georgina Robinson Ranger, Lottie Orr, Issy Jonsson and Gemma Sarney as cox entered in The Hunters Cup. Qualifying as the fastest crew in the morning qualifying race, they then continued to dominate the event, winning both their semi-final and the final in commanding style. The second WJ14 coxed quad of Amelia Fielding Smith, Tilly Lock, Charlotte Moss, Eve Poulter and cox Ellie Crook entered in The Hinksey Founders Cup. With a similar competitive spirit to the first Henley quad, they sculled as the fastest crew in their semi-final and then went on to win the final by over six seconds. On Saturday, Henley crews were entered into six events across the full 2000m race course. And with the weather alternating between heavy rain showers and sunshine, with a strong gusting cross headwind throughout the day, the Henley crews had to use all their experience to cope with the challenging conditions for their qualifying trials, semi-finals and finals. The J16 quad of Charlie Rollet-Manus, Harry Farley, Alex Meyer-O’Kane and Alasdair Roy entered the Kingston Cup with high hopes after their triumphant win at the Junior Inter-Regional Regatta on the same course in April. Their qualifying time of 5 minutes and 45 seconds put them easily into the semi-final, in which they came second and made their way through to the early evening final. During a hard race, the Henley quad started well, and were jostling for second and third place with Wallingford Rowing Club by the half-way point. At the 1500m mark, the fourth placed crew from Claire’s Court School accelerated ahead of the Henley boys. 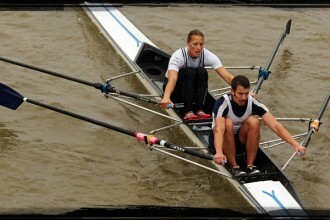 Henley battled on in the final quarter of the race but eventually finished fourth. In the Jim Mason plate, the Girl’s coxed four of Ciara Buckley, Kryssie Steiger, Alexis Perkins, Emily Pimlott and cox Beth Pasco qualified with the fastest time in the morning time trial. With a dominant and straight-forward win in their semi-final, the coxed four went into their final with the competitive attitude that had given them an unbeaten regatta season to date. The crew broke the field in the second quarter of the race with a 3 second lead by the the 1000m mark. They were chased by the coxed four from Glasgow Academy Rowing Club for the second half of the race and although the Scottish boat maintained the 3 second distance, the Henley girls kept up their powerful lead and rowed to the finish line to win well deserved gold medals. In the WJ16 event, Hattie Orr and Ellie Thompson competed in the three rounds for the Simon Sears Cup in a field of 42 entrants. Qualifying fourth in the morning time trial, they then proceeded to win their semi-final convincingly. The evening final turned out to be a highly competitive race. George Watson’s College took an early lead after an exceptional start, leaving the other five crews to battle for the silver and bronze medals. In a thrilling second half of the race, the Henley crew raced Weybridge Rowing Club all the way to the finish line, just taking the silver medal position by 0.3 seconds. The WJ15 coxed four of Alicia Redman, Clare Pearson, Katy Claridge, Ella Wandless and cox Emma Lister competed against 18 other crews for the Katrina Jacks Memorial Trophy. The crew progressed easily through the morning time trial to the semi-final stage, in which they won by over 5 seconds. The final was a battle from start to finish, with the Henley crew racing side-by-side against Bedford Modern School. Through the 1000m mark, they were separated by 0.4 seconds with Bedford slightly in front. This was reversed by the 1500m stage and the Henley crew edged ahead to win another gold medal by 1 second. The Henley WJ15 Eight, competing for the King & Picton Goblets, made a magnificent start to their National Schools’ campaign with an emphatic win in the opening semi-final round, breaking the course record by 3 seconds in a time of 7 minutes and 9.06 seconds. In the final, the crew of Lauren Kay, Lily Stimpson, Florence Wiggins, Maisie Turner, Hannah Gutteridge, Georgia Edwards, Elle Morgan, Anna Roe and cox Rebecca Lister dominated the race from start to finish, opening up a 3 second lead by the half-way point and winning with clear water to take gold medals in their Warranty Direct supported Hudson boat. During the final day of racing on Sunday, the sun shone brightly on the Henley squad with a further three wins and a second place to bring the regatta tally to seven golds and two silvers. In the WJ15 coxed quad events, the B quad of Katie Beale, Ella Wandless, Iona McNab, Anna Roe and cox Lily Stimpson competed against 21 other crews in a morning time trial and went forward to the semi-final with the third fastest time. In the semi-final race, they sculled well against a faster Marlow Rowing Club crew to finish second and guaranteeing them a place in the final. The final proved to be another fierce encounter for the Henley club. In the first 500m Henley pushed ahead of the Marlow crew to challenge Headington School for the lead. For the next 1250m the Headington and Henley crews raced side-by-side, jostling for the lead. In the final 100m, the Henley crew enthralled the cheering crowds with a surge of power to cross the line in first place and take the course record in a time of 8 minutes and 11.7 seconds. 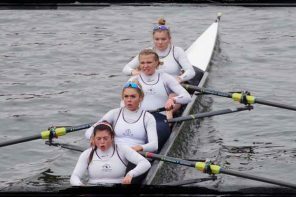 In the A quads, the WJ15 crew of Ella Morgan, Katy Claridge, Clare Pearson, Florence Wiggins and cox Rebecca Lister were motivated to retain the Leslie Langton Cup won by Henley in the previous year. The Henley crew sculled the fastest time in the morning trials and progressed easily into the semi-finals. They performed with confidence in the semi-final with a win over Maidenhead Rowing Club. The final was similar to the B final, with the Henley A crew battling against a Headington School A crew over the 2000m course. Headington started quickly and took an early lead by a boat length. By the 1000m mark, the final was a two boat race and although Henley pushed hard to get ahead of Headington, the Oxford school resisted. In the final 250m the crowds were given a race to savour. The Henley crew came back strongly, but the Headington crew held on to first place by just a second leaving Henley to take the silver medal position. In the final race of the regatta for the Henley club, the crew of Lauren Edwards, Maddie Orr, Ellie Thompson and Hattie Orr sculled in the WJ16 quad event to compete for The Colonel’s Cup. The crew, who have been unbeaten in the WJ16 quad event this season, gave another dominant Henley performance in the time trial to guarantee them a place in the semi-finals. With little challenge from the other five semi-finalists, the quad won easily with clear water. In the final, the Henley girls led from the start and gained a boat length lead within the first 100m. By half-way, the lead had extended to 8 seconds, and the Henley crew continued to accelerate away from the second place St Neots Rowing Club boat. 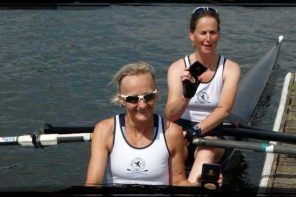 Winning gold in a time of 7 minutes and 36 seconds, and a massive 13 seconds ahead of the silver medallists, the Henley crew reinforced their dominance in the quad sculls. Henley Rowing Club are currently looking for coxes to join the Junior Squad. If you would like to try coxing and gain the opportunity to race at some of the biggest rowing events, then please contact the club. The club also run Summer Camps for those wishing to try rowing for the first time.